To receive advance information of visits please contact us here. The Birmingham Assay Office Act of 1902 allowed the Assay Office to purchase ‘books and objects of art or manufacture relating to the silver or jewellery trade’. The junior Assay Master at that time, Arthur Westwood, started collecting Birmingham silver, especially to provide examples of pre-1840 hallmarks, of which Assay Office Birmingham had no record. However, the Silver Collection has grown to the point where it now demonstrates so much more than Arthur Westwood’s original intention. The collection showcases the enormous wealth of talent possessed by the city’s silversmiths through history. The need for the hallmark is as strong now as it was in the 18th century since the hallmark protects the public and the jewellery and silversmithing trades. Precious metals are most commonly used as alloys; mixed with base metals, and even an expert cannot tell by looking whether an article contains the declared proportion of precious metal. The UK system of statutory hallmarking by an independent Assay Office is rare in world terms, and it has contributed to the growth and success of the jewellery and silversmithing trades in the UK. Hallmarking severely restricts the opportunity for fraud, so traders compete on a level playing field and consumers can buy with confidence. Hallmarking is a living part of our heritage, and it is important that it stays that way. The Silver Collection at Assay Office Birmingham is an historic collection of spectacular objects created by some of Birmingham’s most celebrated Silversmiths including Matthew Boulton, Nathaniel Mills and Elkington & Co. The complete tour will last for approximately two hours. From snuff boxes to vinaigrettes, card cases to caddy spoons, and buttons to buckles, the ingenuity and skill of Birrmingham’s silversmiths is evident, and the beauty and elegance of these diminutive objects are still apparent. Matthew Boulton is perhaps best known for his partnership with James Watt and his association with the Lunar Society, but Boulton’s creative talent led him into many other enterprises during his lifetime. Indeed, of all the figures from Birmingham’s history, it is Boulton who embodies the entrepreneurial spirit that characterises the city today. The Assay Office is proud of its heritage, as it is the only one of Boulton’s enterprises that remains, still carrying out the statutory duty with which it was charged under the Act of 1773. In its own way, the toy trade in Birmingham was responsible for the early career of Matthew Boulton, and therefore, for the establishment of the Assay Office. Boulton inherited his father’s toymaking business in Snow Hill, but he was determined to expand his range. A highly ambitious man, by the early 1760s he had started work on the Soho Manufactory, located just outside Birmingham, at Handsworth. ‘Presented by the British Jewellers’ Association to commemorate the bicentenary of The Birmingham Assay Office 1773-1973’. On the base the fruit bowl is marked A. Edward Jones Ltd., St Dunstan Works, Birmingham. 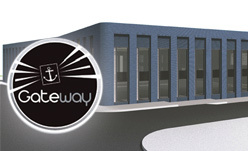 The Assay Office’s new home is located within the St George’s development, fronting Icknield Street. This site will provide a prominent location for the new Assay Office at a gateway to the Jewellery Quarter.